Baton Rouge, LA — February 16, 2018 — Lamar Advertising Company (Nasdaq: LAMR), a leading owner and operator of outdoor advertising and logo sign displays, today announced that its wholly owned subsidiary, Lamar Media Corp. (“Lamar Media”), intends to redeem in full all $500,000,000 in aggregate principal amount of its outstanding 5 7/8% Senior Subordinated Notes due 2022 (CUSIP No. 513075BB6) (the “Notes”). The redemption will be made in accordance with the terms of the indenture governing the Notes and the terms of the notice of redemption. Lamar Media expects the Notes to be redeemed on March 19, 2018 (the “Redemption Date”) at a redemption price equal to 101.958% of the aggregate principal amount of the outstanding Notes, plus accrued and unpaid interest to (but not including) the Redemption Date (the “Redemption Price”). The Redemption Price will be due and payable on the Redemption Date upon surrender of the Notes. Lamar intends to fund the redemption through borrowings from the establishment of a new term loan facility under Lamar Media’s senior credit facility (the “Term Loan”). Lamar Media expects to amend its senior credit agreement to establish the Term Loan on or before the Redemption Date. Lamar Media’s lenders have no obligation to establish additional term loan facilities (including the Term Loan) under the credit facility, but may enter into such commitments in their sole discretion. A notice of redemption is being mailed to all registered holders of the Notes by The Bank of New York Mellon Trust Company N.A., the trustee for the Notes. Copies of the notice of redemption may be obtained from The Bank of New York Mellon by calling 1-800-254-2826. This announcement is for informational purposes only and is not an offer to purchase or sell or a solicitation of an offer to purchase or sell, with respect to the Notes or any other securities. This press release contains certain forward-looking statements within the meaning of the Private Securities Litigation Reform Act of 1995, including statements regarding Lamar Media’s ability to fund redemption of the Notes and establish a new term loan facility under its senior credit agreement. These statements are based on management’s current expectations or beliefs, and are subject to uncertainty and changes in circumstances. Actual results may vary materially from those expressed or implied by the statements included herein due to changes in economic, business, competitive, technological, strategic and/or regulatory factors and other factors affecting the operation of the businesses of Lamar Media. More detailed information about these factors may be found in the filings made by Lamar Advertising Company and Lamar Media with the Securities and Exchange Commission, including in the Risk Factors section of their combined Annual Report on Form 10-K for the year ended December 31, 2016, and to the extent applicable, subsequently filed Quarterly Reports on Form 10-Q and Current Reports on Form 8-K. Lamar is under no obligation, and expressly disclaims any such obligation, to update or alter its forward-looking statements, whether as a result of new information, future events, or otherwise, except as required by law. 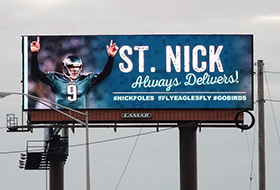 Lamar Advertising of Philadelphia-Reading shows its Eagles pride on digital billboards in Philadelphia leading up to the Super Bowl. 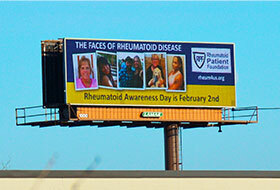 Lamar Advertising Company is supporting Rheumatoid Awareness Day through the donation of more than 200 billboards across the country which will feature messaging designed to raise awareness of this life-shortening disease.